Not an expert by any means so you can take my review with a grain of salt. Now in retirement I decided I wanted to build stuff like built-ins for my TV room, interior barn doors, and real wood kitchen cabinets. Just one thing, I’ve never built anything interesting other than subwoofer boxes in college some 30 years ago, and though they sounded great – they weren’t pretty. Fast forward to 2016, I have started buying a variety of tools and decided I needed a decent drill press but knew its time with me would be limited. It’ll be maybe a year or so before it will end up in a garage sale so I didn’t want to spend too much. So after reading dozens of reviews praising THIS model, I marched over to my Lowes and I negotiated a 15% discount (they don’t take HF coupons for some reason). I put it on my Lowes card for an extra 5% off and then it sat in my garage for a few weeks before I could clear out a small space for it. Well yesterday was the magic day. After cleaning and wiping all the shipping oil it was slathered in, everything was together and ready to go in about 45 minutes. So I fired it up and, as you can tell by the title, I did not luck out like everyone else. What’s the problem? Well the quill thinks it’s a gyro, has 1.6mm run-out, the laser is off by a 1/4” and the top belt housing came dented even though the foam was intact and was factory strapped. Overall the run-out wasn’t too bad since I am not a professional and only I will know that I used a cheap drill press, but from what I’ve read, the chuck and arbor needs to replaced. This is absolutely ludicrous in a new machine, so I ended up returning it. I only tested it for run-out before boxing it back up, but give it a fair 3.5 stars for what it is, an entry level drill press for non-precision projects. Just be prepared to return/exchange this 150 lb hunk of metal if you are unlucky like me and don’t hit the lottery like everyone else seems to have done. Now I am waiting to see if a more expensive brand that is a bench top (instead of floor model), goes on sale and hope I have better luck the next time. Models I am looking at are the Shop Fox w1668, Jet J-2530 and Grizzly g7943. I’m also considering a radial just because it looks convenient like my DeWalt sliding miter. I have had the shopfox W1668 since 2004, and the only issue I’ve had with it is the oscillating rubber belt (more like a O-Ring) disintegrated, but I never really used it, and it had been sitting in there for 12 years. Other than that, the only complaint I’d have is the angled depth stop flexes too much. I’d definitely buy it again. That’s a shame. I bought the same drill press several months ago and have been very satisfied with it. The laser on mine was dead center and I haven’t noticed a terrible run out problem. Maybe you got a lemon. I bought a WEN benchtop model through Lowes and it’s the most robust well built tool I’ve ever owned. It’s rock solid, quiet and came dead on out of the box…. Sorry to hear the bad luck. From my experience, as useful as a radial drill pres can be, I find my grizzly to be far from accurate/square and the head flexes too much with respect to the table when applying moderate pressure. So be cautious with these. 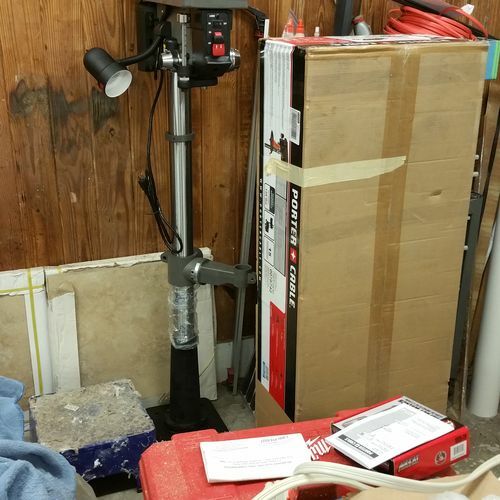 I have a bench top 2/3 HP craftsman and a Shopfox radial arm drill press. I have had the craftsman for somewhere around 20 years and the shopfox for around 5. Both are good for my needs. But, I use the craftsman for 95% of everything I do. I would buy both of them again. Sorry about your experience your experience with the Porter Cable. I have always had good luck with their tools. I’ll second dday. I have a wen 4210 I paid $114 for it and I love it. They make larger models too. I got mine from home depots web site. Go Grizzly. You won’t be disappointed. I have the same DP and mine was pretty much dead on. I had to tweak the lasers but that was it. Are you sure the chuck was installed properly. I was surprised it was really just a friction fit and needed to be hammered in. Sounds like there was some debris preventing it from seating properly. Don’t let it deter you and go ahead and get one, if you get a good one it’s a great deal. I tend to be unlucky with just about everything. -My doors hinges are rusting in my 2014 Mazda (not covered by factory warranty), wish wife let me get another F150 now that it’s aluminum. So don’t let my bad luck get in your way. In my case, a benchtop drill press seems to take up too much space. Floor models seem actually easier to locate. That being said, I bought the same PC floor model, around $300. Had trouble dialing in the laser and decided just to scrap it (a decision made easier when I broke one of the mounting brackets). No matter, don’t trust nor need lasers. Otherwise I have been very happy with this machine for about 4 years now. Guess I don’t do a lot of really “precision” work with it, but it does what I need. Maybe a little runout(?) but not enough to bother me. At least I know that my holes are pretty close to 90 degrees. That specific machine may have been a bad one i think Lowes will exchange it for another one. I would be more interested to hear about the design and practical use of the press drill. What are its limitations compared to more expensive models? For example, the table seems significantly smaller than other drills. But can it be tilted? After much deliberation in trying to find a comparable dp value like the Porter Cable, I ended up buying another one at Lowes this afternoon. The manager was not happy about giving me the same 15% discount that the other manager had done. We waited roughly an hour for them to get it down from somewhere and they loaded it via the same forklift right into the back of my SUV. I hope all goes well this weekend and I can start making a table & fence for it. Well today I finally got around to putting together the drill and this one is better. I labored with the installation until I came up with a good idea. I re-taped the box it came in and set it vertically on its side. Got my small 1-step stool in photo. Psyched myself up and lifted the motor onto the box. Then stepped up and transferred it onto the post. 1-man job. The stool shown is about 9” tall and I am 6-1.5” so make sure to get the right one for your height. How is the run out on the new machine? Of all the Lowes in my area, there are only two new ones left. Thinking about buying one today, so if there is a problem, I can still return it for the last one? Of course they will be blowing out the floor models, and I could check the run out at the store before hand….